Apparently it’s easy to beat the market. Randomly-selected stocks can beat the market, as recently discussed on the Predictive Alpha website. You can even beat the market just by choosing stocks whose names begin with the letters that make up your own name (as discussed in an amusing blog post by Andreas Clenow here). If it’s that easy to beat the market, why aren’t we all rich? I’m still working on that problem but I’ll let you know when I figure it out. Meanwhile, I started musing about whether yearly returns were mean-reverting, momentum-based or something else. For example, do the worst-performing stocks of one year rocket back to success the following year? Or do the best performers of one year continue their trend to the next? Perhaps neither? Let’s find out. I looked at all the historical constituents of the S&P 500 for each year from 2000 through 2014**. At the close of the very last day of the year, I calculated the gain/loss of each member of the index for that calendar year, and ranked them from worst to best. I then divide this sorted list into “vigintiles”, or 20 sets. (I’ll have to thank Dr. Howard Bandy for introducing me to the term “vigintile”). 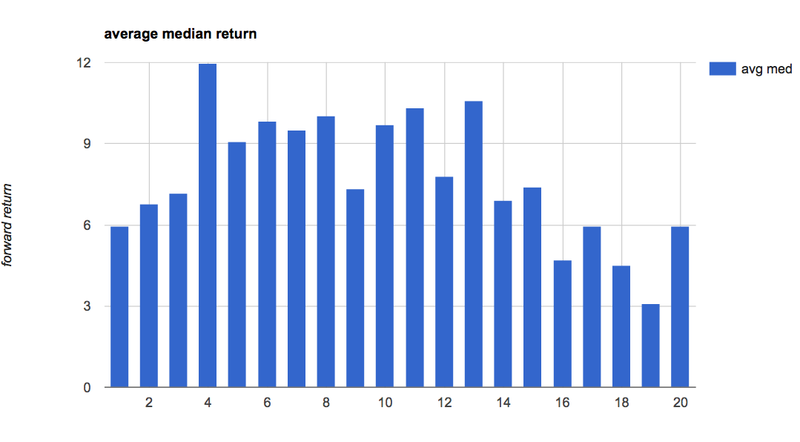 I then calculated the median forward-year return for each vigintile, for each year, and then averaged those median returns. Hmm, this is telling a different story. The worst vigintile isn’t showing the same bump when we look at the average of the medians. That means there are some outsized returns in the data that are skewing the average, and may not be repeated in future (or at least, not repeated when you were hoping they’d be). The middle of the range looks more enticing. Note that the top vigintile (i.e. best 25 stocks in a year) shows mediocre performance in both charts. Much like the Sports Illustrated Cover Jinx, huge success may be mean-reverting. Below you can see the maximum and minimum forward gains and losses for each vigintile. 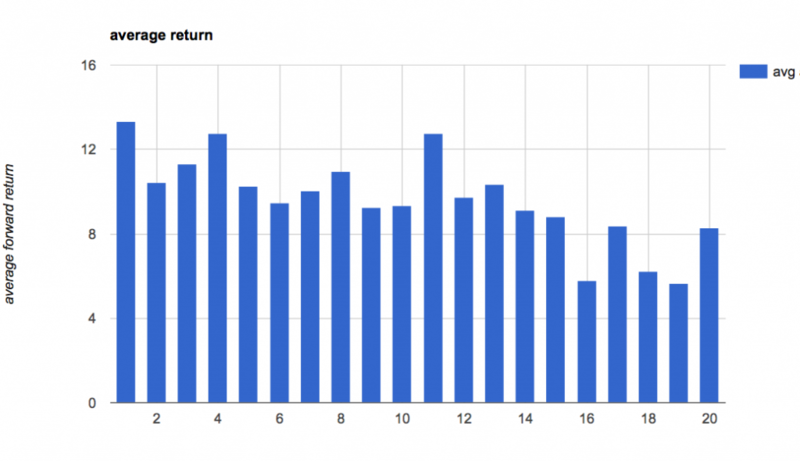 The worst stocks exhibit both extremely positive and extremely negative returns. In other words, they’re more volatile. 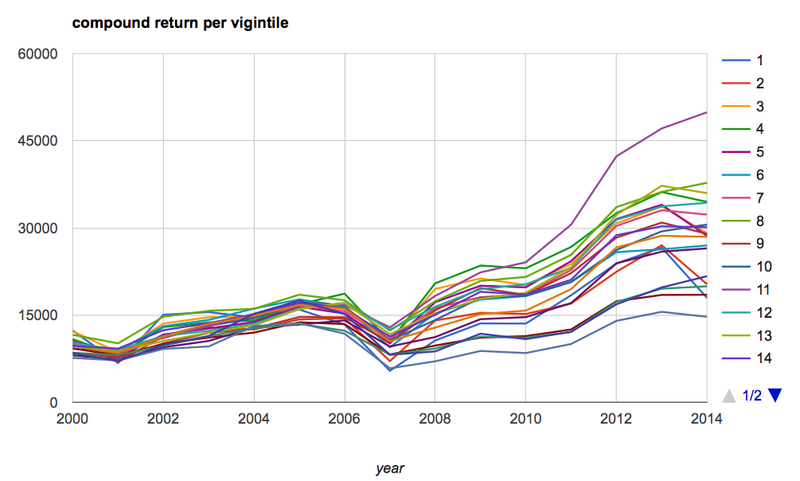 Now let’s take a look at selected vigintiles and see how they performed over the period in question. Above are the yearly forward returns for vigintiles 1, 11, and 20 (worst, middle and best). This confirms our suspicions (I’m assuming you’re suspicious too, and not just following along numbly). The worst vigintile (blue) has some really awesome subsequent years, but also some pretty bad years. 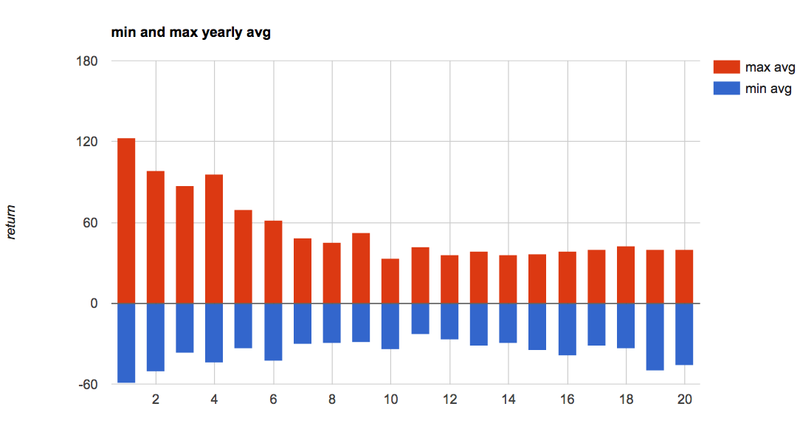 The worst and the best (orange) vigintiles also have more loss-making years than does the middle (red). Let’s investigate that further. What if we were to trade our favorite vigintile over the years? At the end of each year we buy the 25 stocks that were ranked together in a performance vigintile, held them until the end of the following year, then sold and bought the new set of stocks in our vigintile. Rinse and repeat, compounding gains and losses as we go. 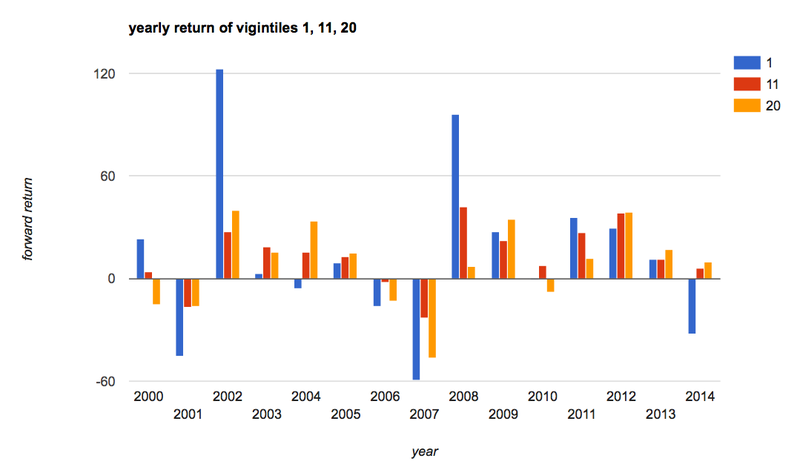 Below is a graph showing the returns of each vigintile, if I’d started with $10,000. No commissions (and no ordinary dividends) are taken into account. Before you get too excited about that purple line, it’s probably a bit of an aberration. That’s vigintile #11. I don’t know why it’s so much higher than the rest, so assume results won’t continue. Also, it didn’t start out-performing until 2010. None the less, there’s definitely a spread, and some vigintiles perform better than others. 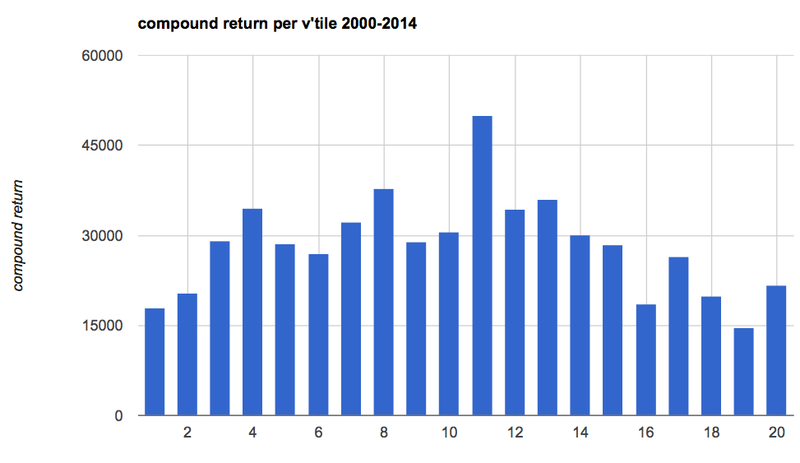 And here finally (above) is a graph of the total compound return of each vigintile. Many of them beat the S&P 500. And the best ones, perhaps counter-intuitively, are in the middle. The boring mediocre performers show less volatility, less drawdown and consistent gains compared to either the worst or best performers. Just for chuckles, here are the 25 stocks that fit into the 11th vigintile for 2015. I’ll check back in a year (maybe) and see how they performed. Update 12/31/16: I did follow up on this, which you can read here. ** By looking at historical constituents of the S&P 500 index, I avoid survivorship bias. One detail about survivorship I’m unable to eliminate though: if a stock was a member of the S&P 500 and then went bankrupt the following year, I don’t necessarily have a 100% loss recorded. I only have until the end of the data stream. So if a stock was acquired or delisted, the return is recorded as the last day of trading for that stock, rather than the last trading day of the year. In the event of bankruptcy, I don’t have “zero” as the final trade price. I don’t know how often this happens, and how much it would skew the data. In practicality, any stock that was performing abysmally would have a very low price before being delisted, so most of the loss would be captured in this research. May it would be interesting to group vigintile by volatility or also tracking error and analyze forward return. Both good ideas for a future post or two. Thanks! may I ask where you found historical components of the index? Sure! I use Norgate Premium Data. They offer historical and delisted stock data. I’m also using a beta system that includes historical membership of the major indices, which is how I was able to use this data without ‘index survivor bias’. I think that service will be available to the general public in the next few months, but I’m not sure.